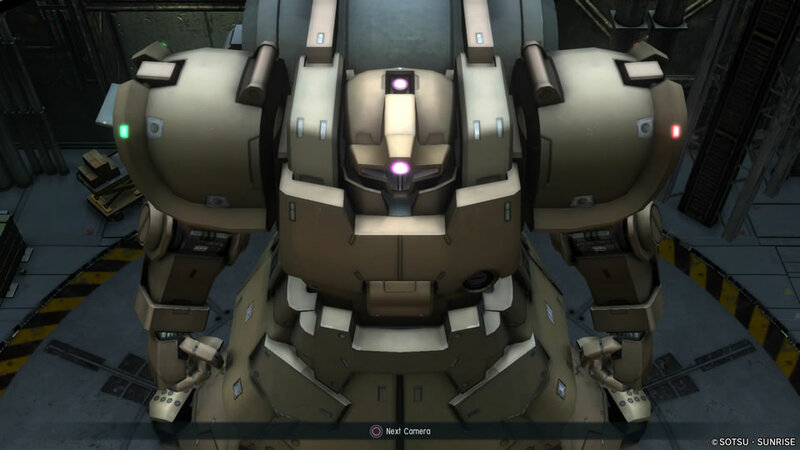 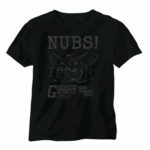 A little interesting thing I saw while taking screen shots of the thing off Gundam Battle Operation 2. This Dom has a second camera mono eye on the top of it’s head. 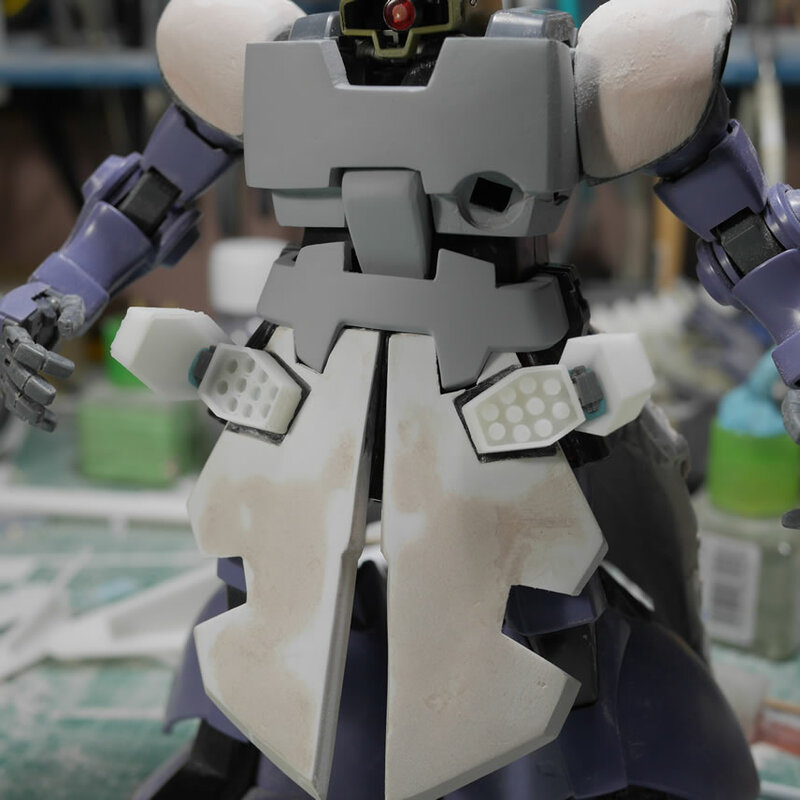 I guess this makes sense since the forward facing mono eye has limited view since the majority of the head is blocked by giant shoulders. 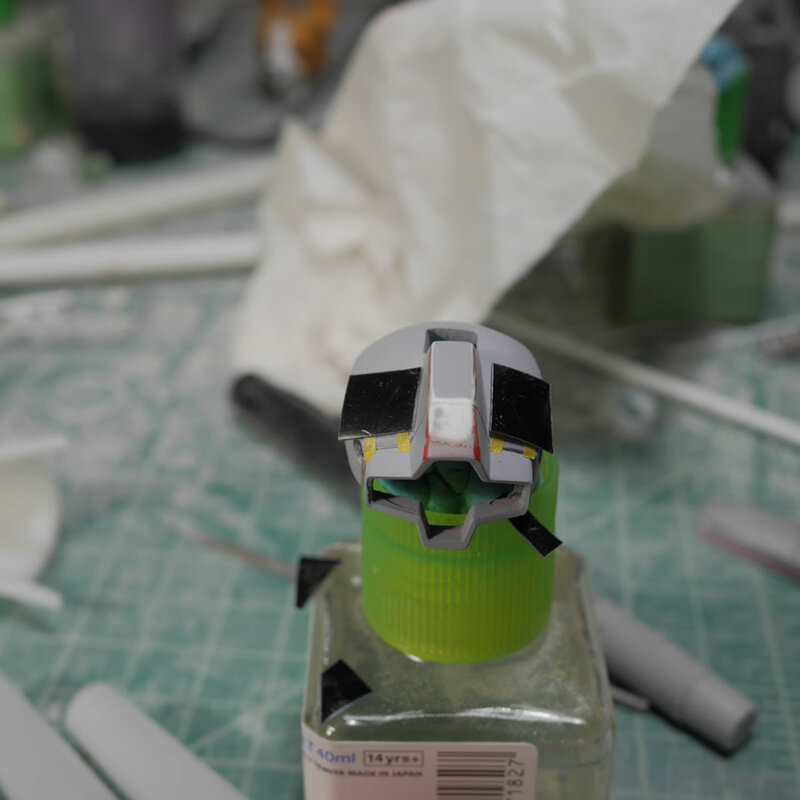 So to keep with the reference materials, I add this modification to the head as well. 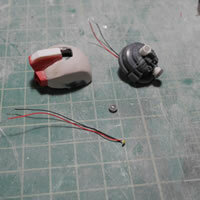 The visor piece was cut and I drilled out the top of the head. 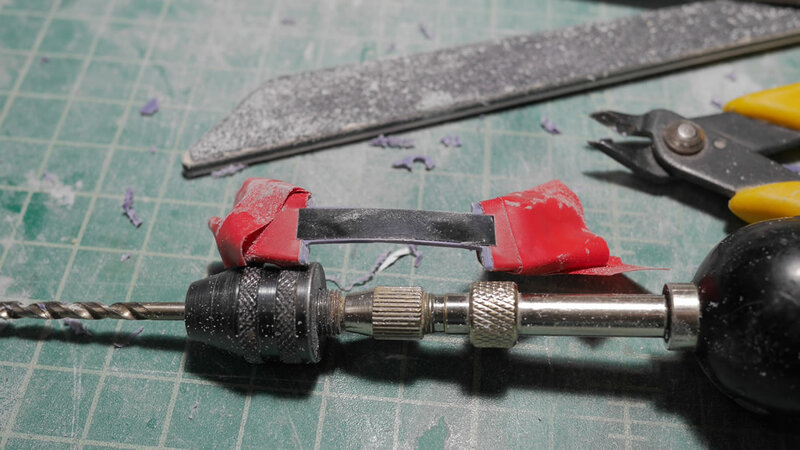 Once I had a pilot hole drilled out, I used metal files to start shaping out the square opening. 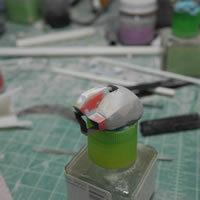 For the internal piece, I cut the top of the part and sanded it down so that I could glue a piece of styrene tube. 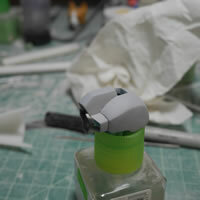 This will hold the second head LED as well as the camera lens. A quick test assembly is done to make sure everything works. The last picture shows the parts of the head. 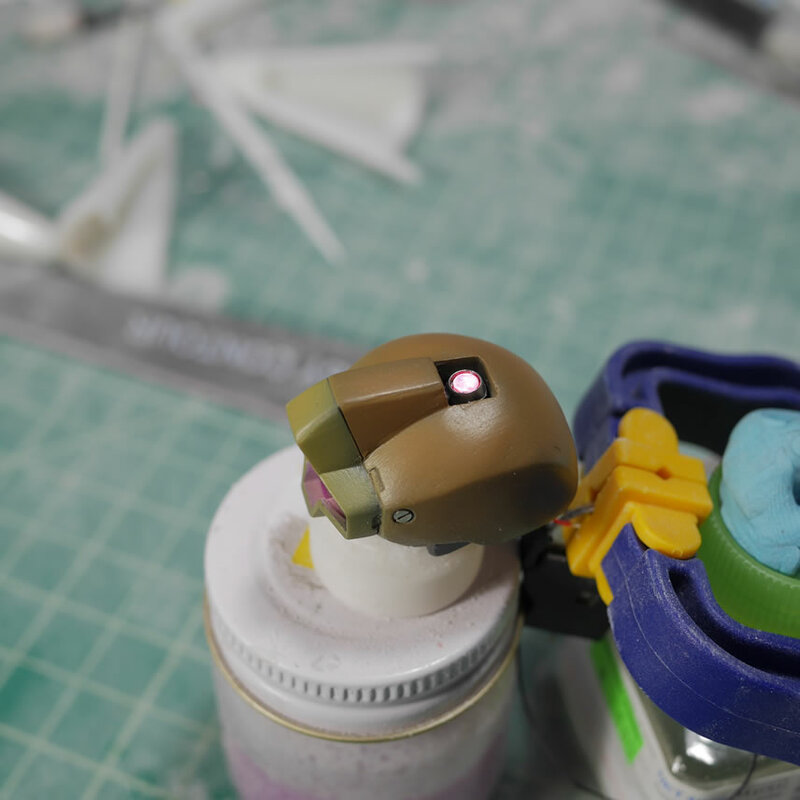 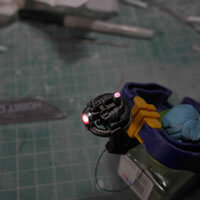 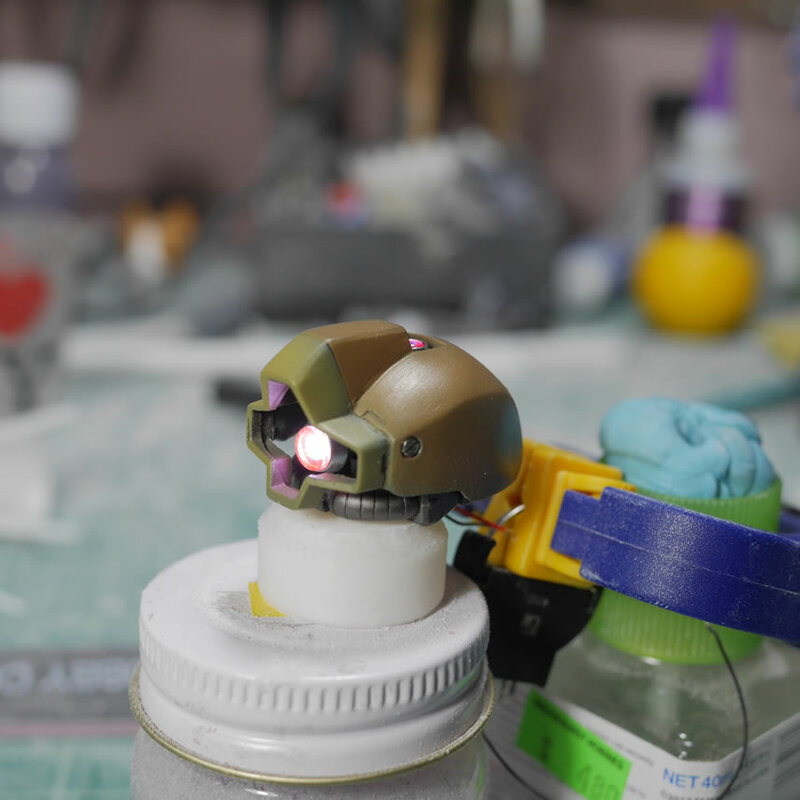 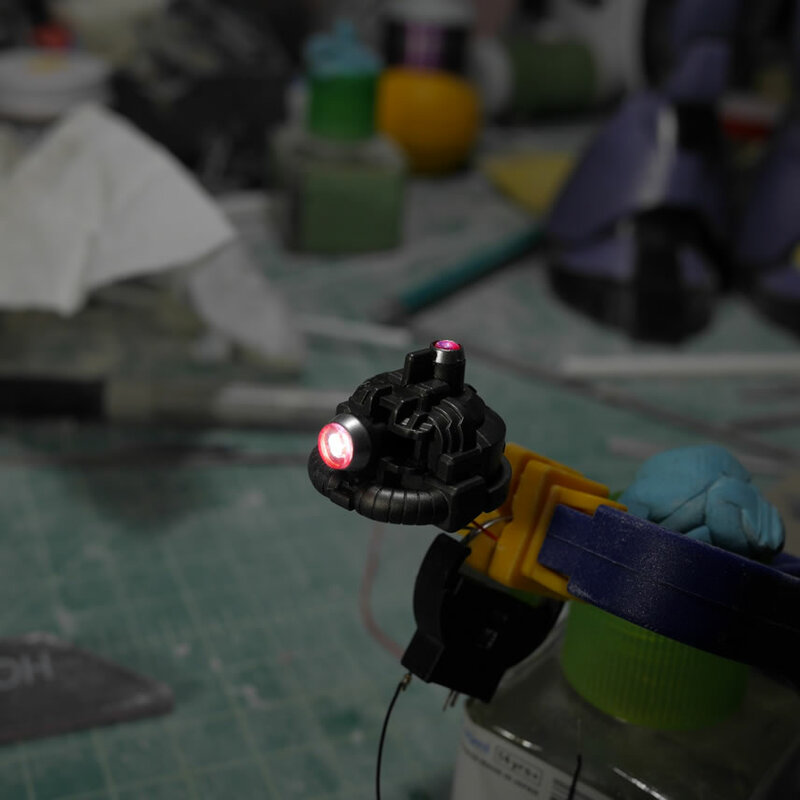 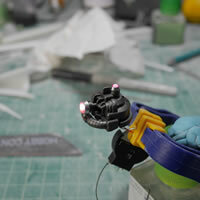 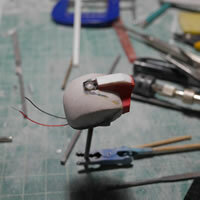 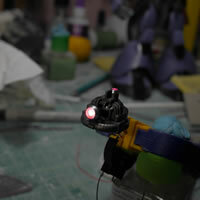 The additional SMD LED wired, the modification to the inner head, the lens, and the head armor. First priming session will show all the areas that need more work and attention. 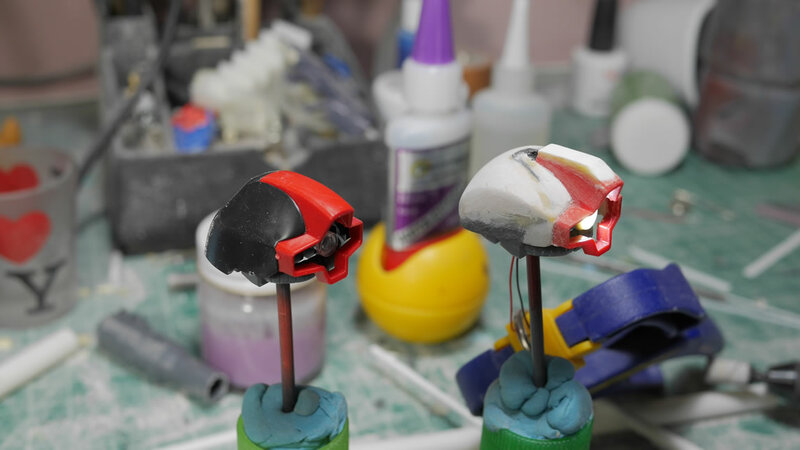 There are gaps to fill, some potholes, and areas to sand. 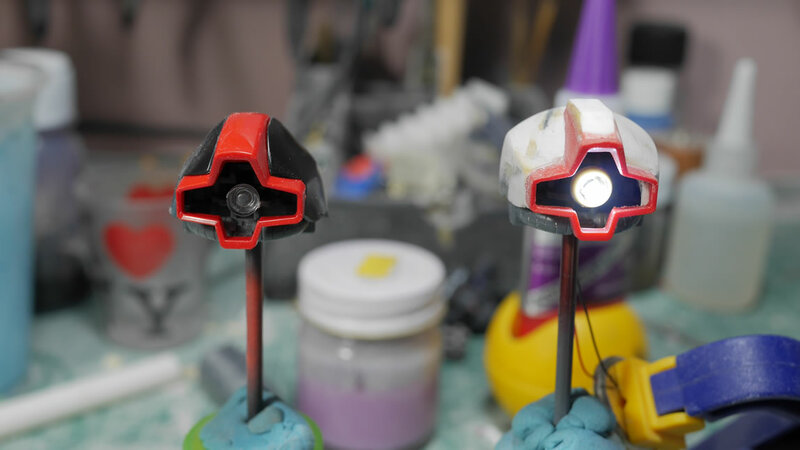 Light curing putty to the rescue. 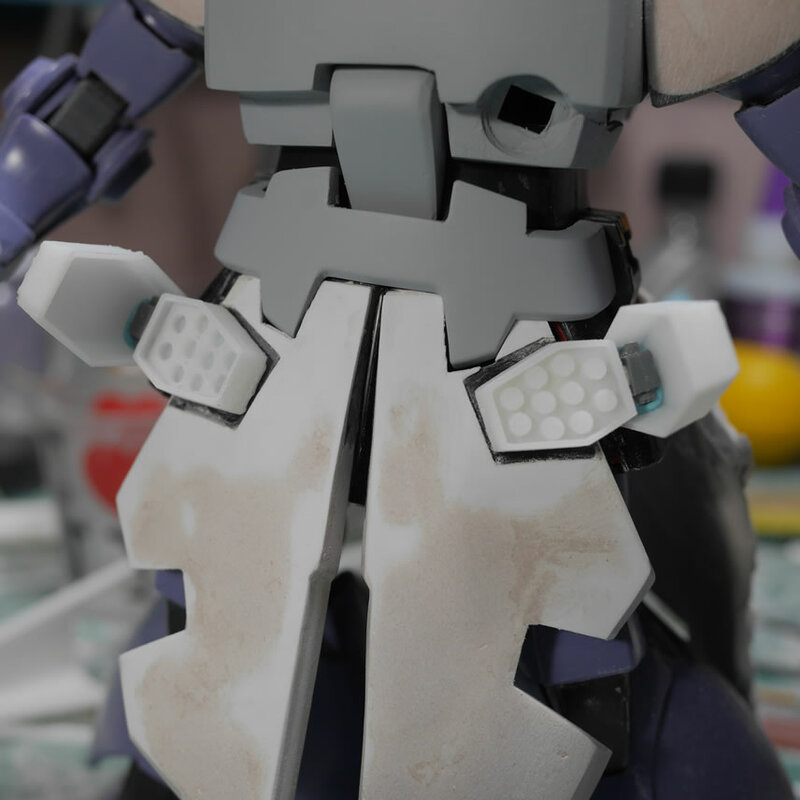 The gaps and potholes are filled with light curing putty and then everything is sanded down again . The primer really helps the process here since missed sanding areas will show up nicely and it is easier to the surface imperfections. Another priming session and we’re ready for the next steps in detailing the head. 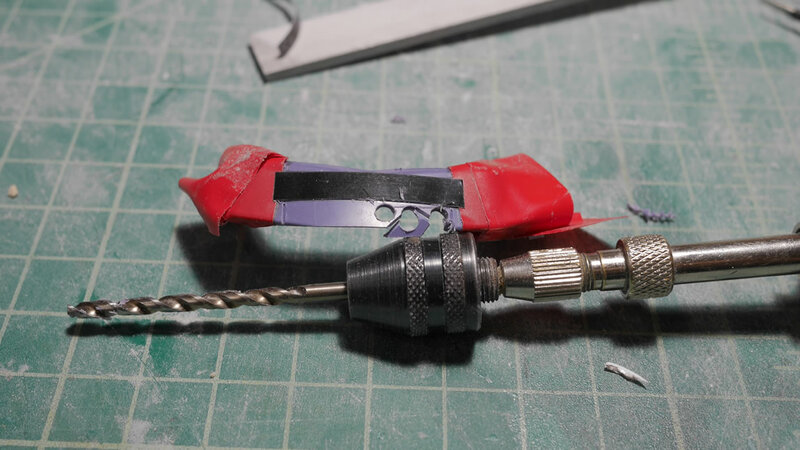 The thing to note is that there is an order of operation here. 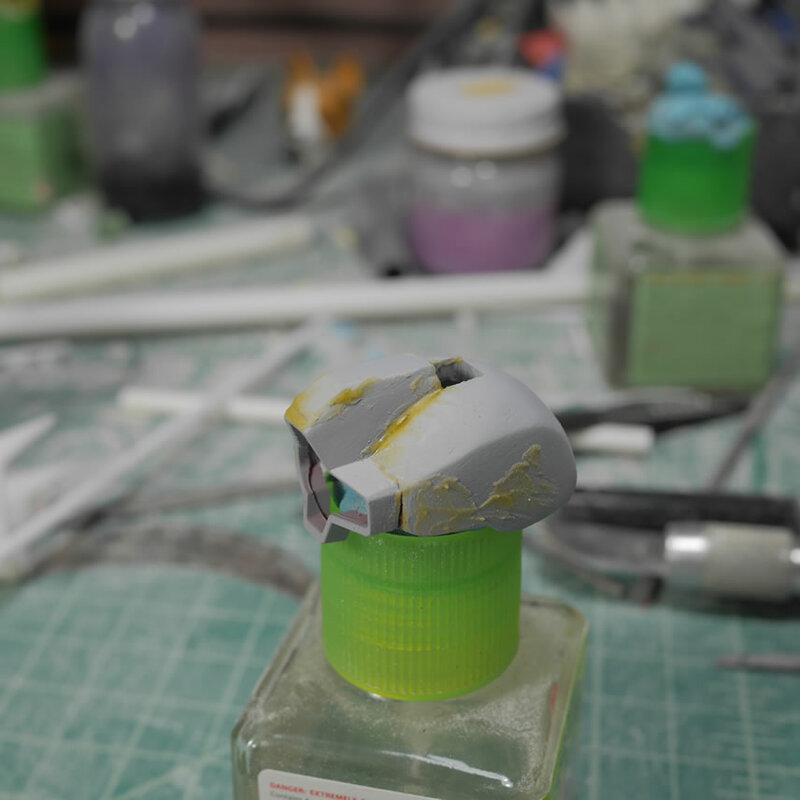 The major rework to the head needs to happen first and all the priming and sanding sessions to get the surface looking correct. After all this, we can get down to smaller surface details like scribing in new lines and such. 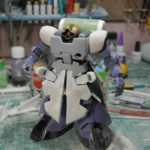 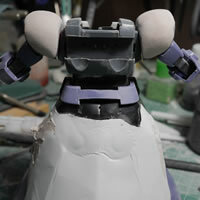 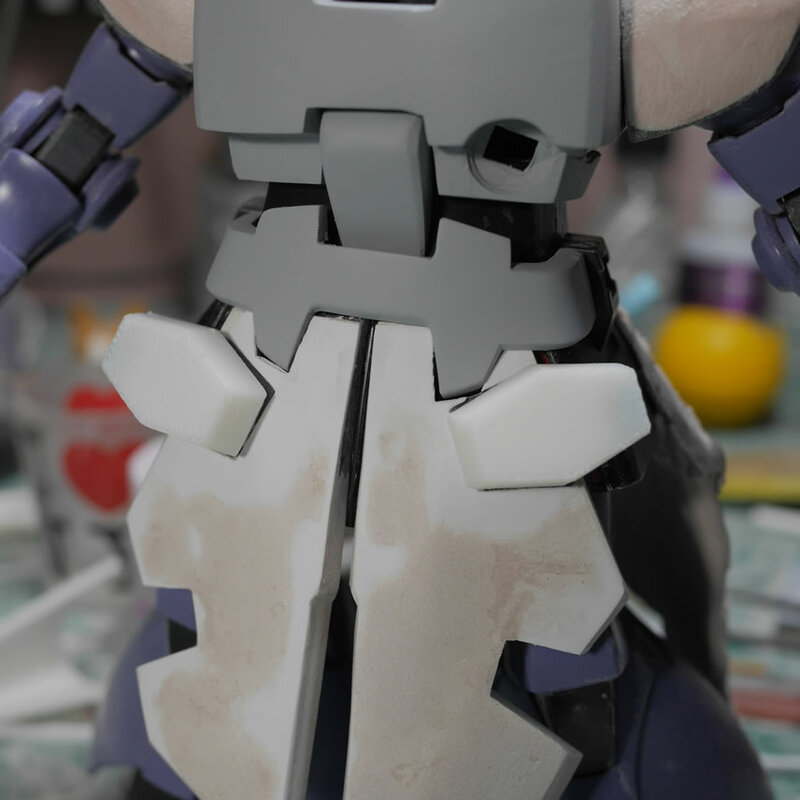 If I started scribing in the small details first, they would end up getting lost in more putty or the sanding sessions. 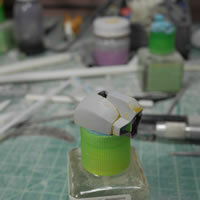 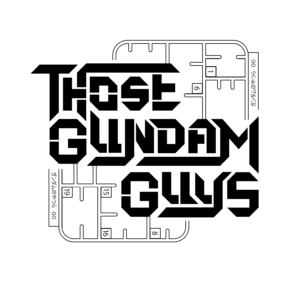 Dymo tape is used to create a few guides for the scribing tools. 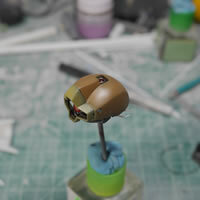 I also drilled out a small circle to drop in a metal detail piece. While all the above is happening, the internal parts are getting painted. 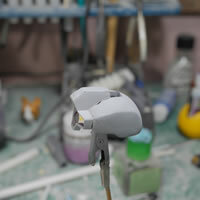 THe main head internal is painted with alclad magnesium. 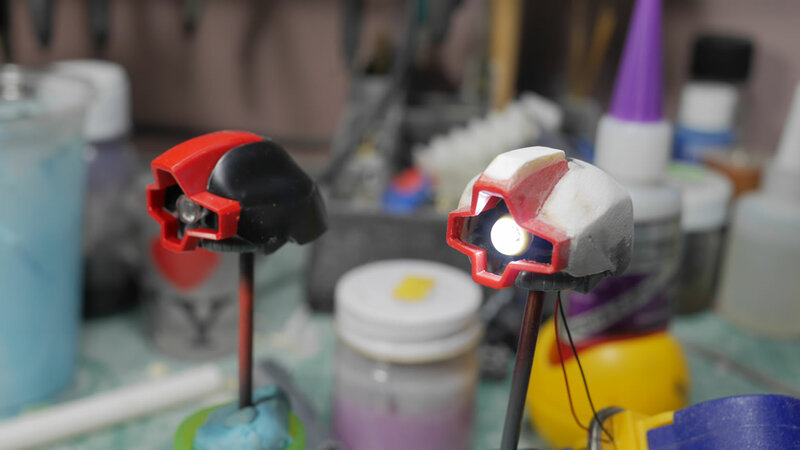 The mono eye lense are painted with clear red on the edges to create a pink ring when lighted up. I also wired up the two LEDs in parallel and have one set of wires coming out of the bottom of the head. The head is painted with the standard Dom Barrage color scheme. 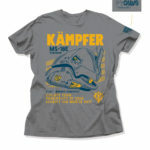 Or what I see as the standard desert themed scheme. 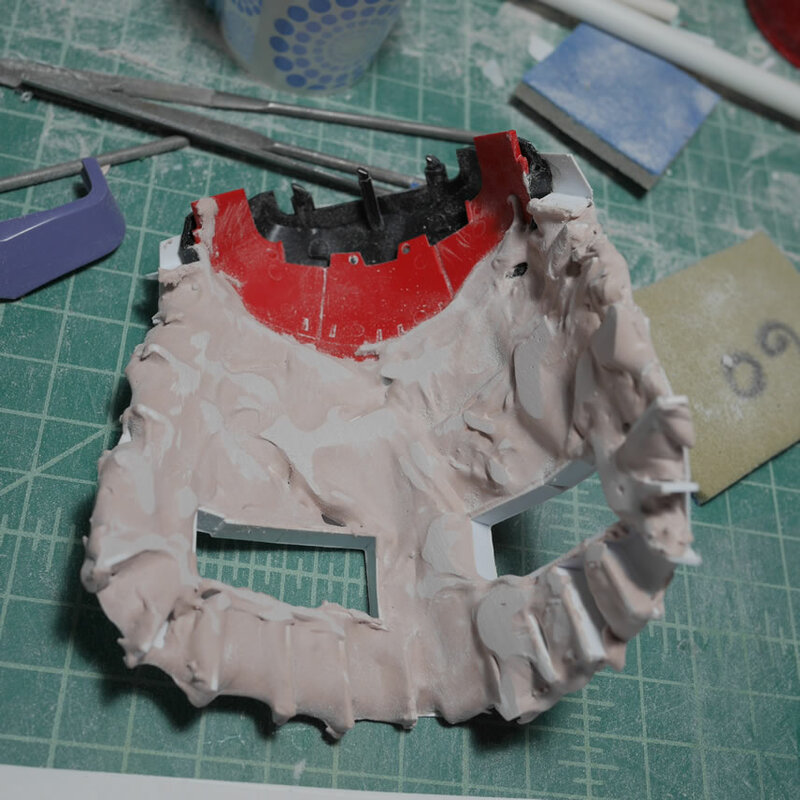 Using the dehydrator, I’m able to speed up the work time by several orders so I effectively did all the paint work in one day. 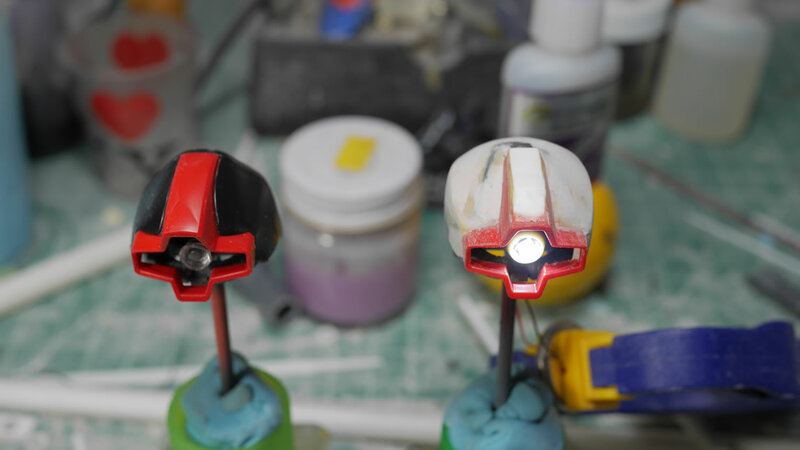 Masking and painting, the head armor is almost complete. Assembling everything together I have an almost completed head. There are still some rough spots but I wanted to feel like something got accomplished. 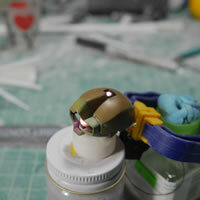 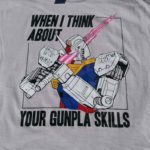 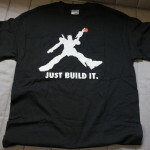 I will probably go back and fix some issues with the head while I continue to work on the rest of the kit. 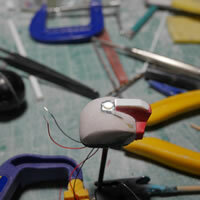 There is a sense of accomplishment with a small part of the project this close to being done. Returning back to the skirts, the bottom of the plastic sheet for the skirt needs some structure or the putty has nothing to stick and hold on to while it cures. Stripes of styrene are cut and glued into place. 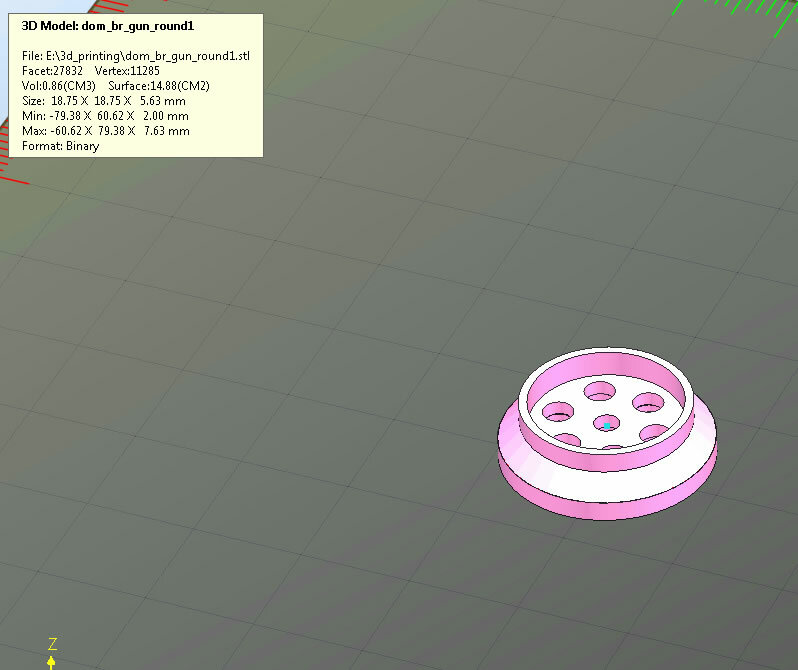 I also 3D designed and printed a prototype for the rear thruster engine covers for the skirt. 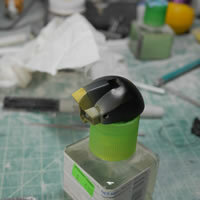 The rough look is there, and like everything else in this project, a huge amount of refinement is in store. 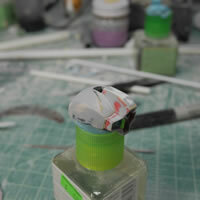 Since the plastic skirt piece was printed on a flat sheet of styrene, it wanted to stay flat. 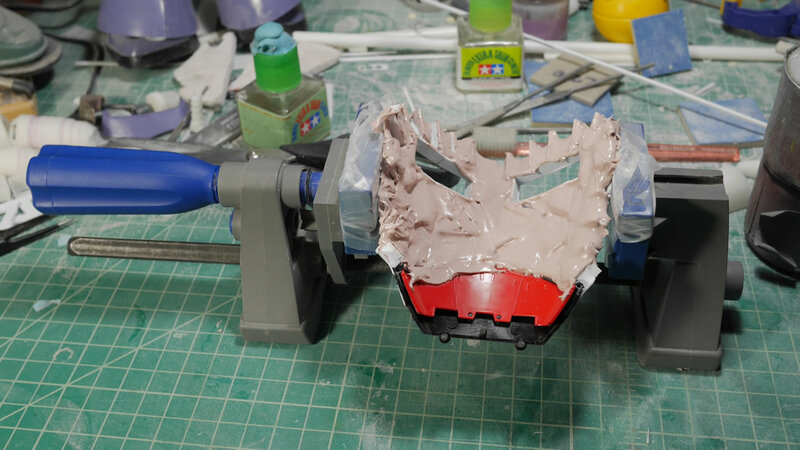 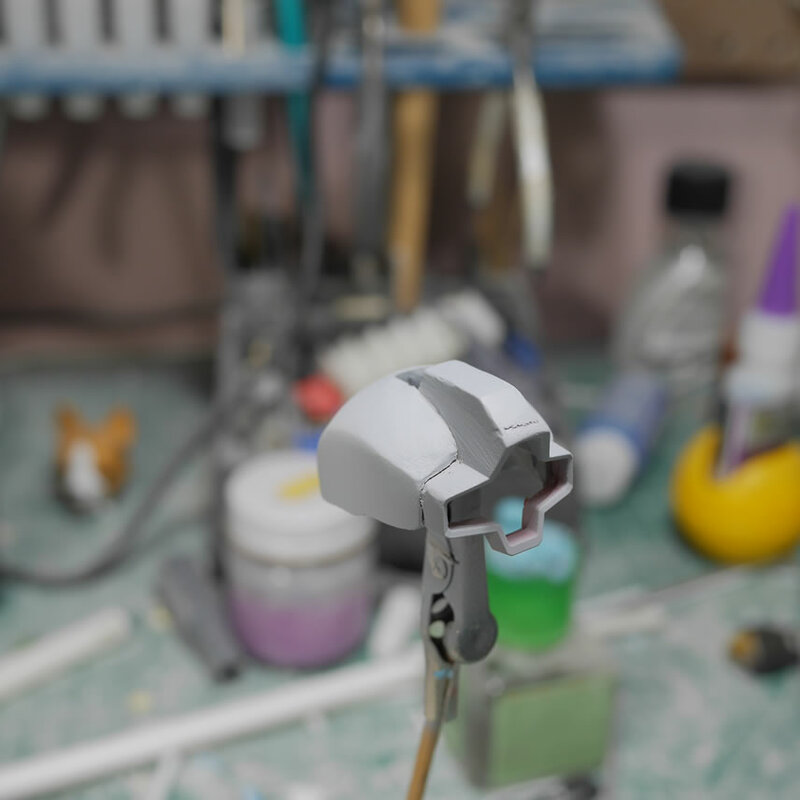 When I applied the polyester putty, I also put the whole assembly into a vice to bend the sheet while the putty cured which would result in a more curved piece. 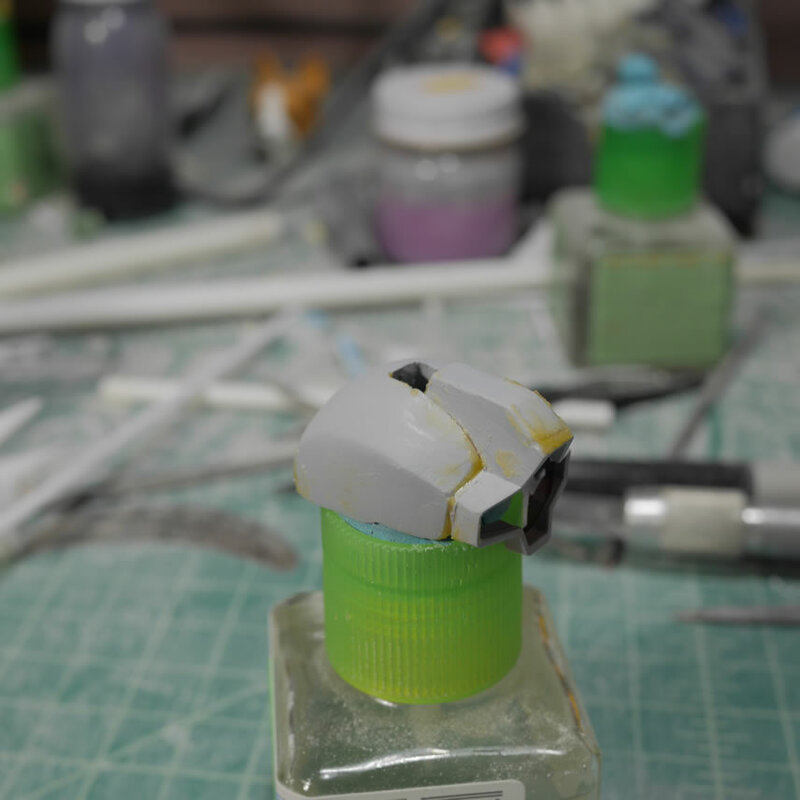 And then a more curved piece I got. 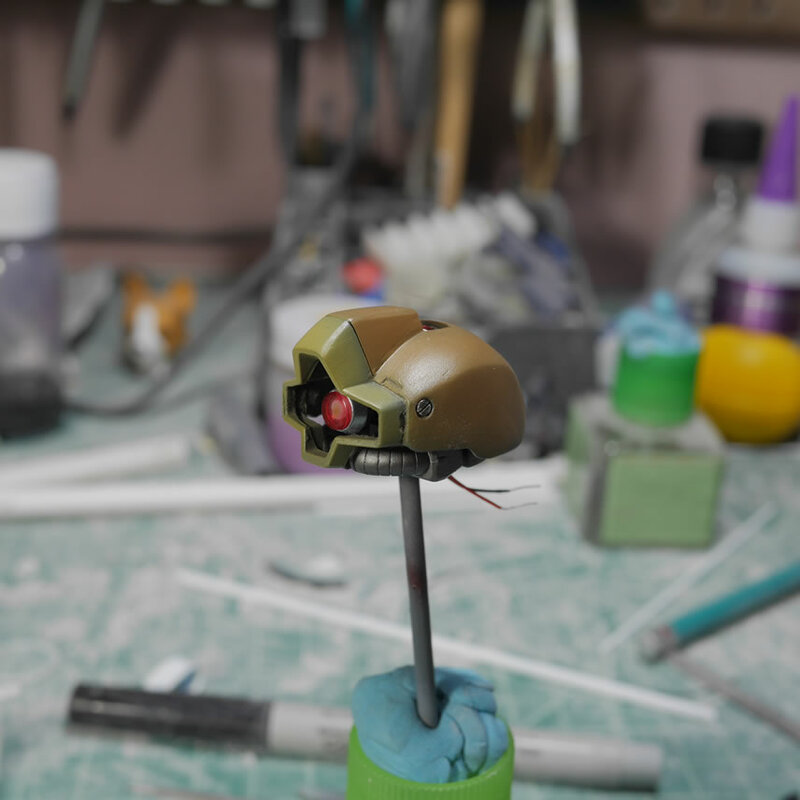 I applied another layer of putty to continue the build up for the part. 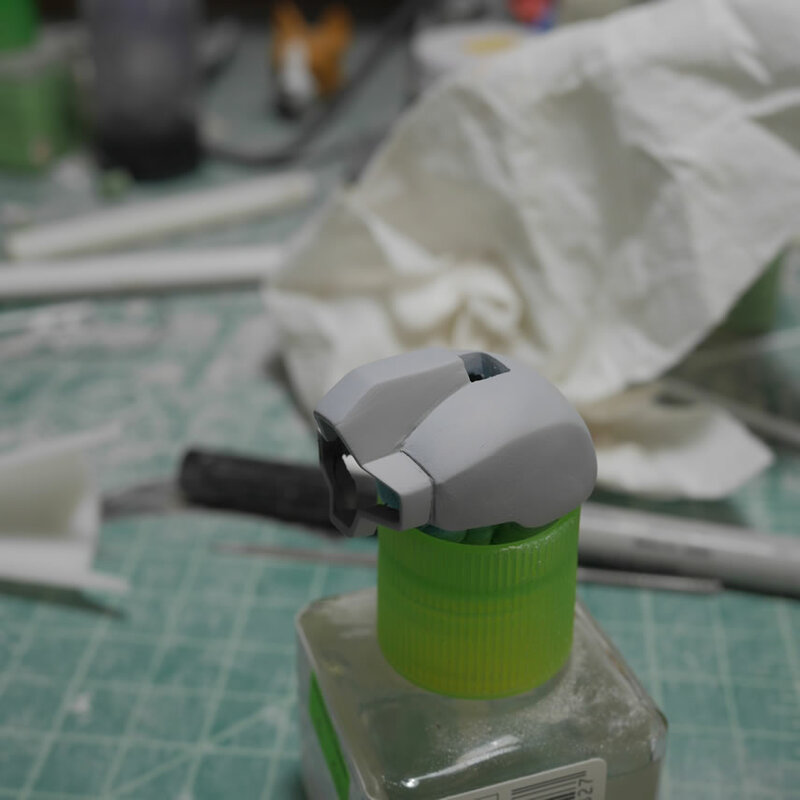 After some test fits, I found that the part was too curved. 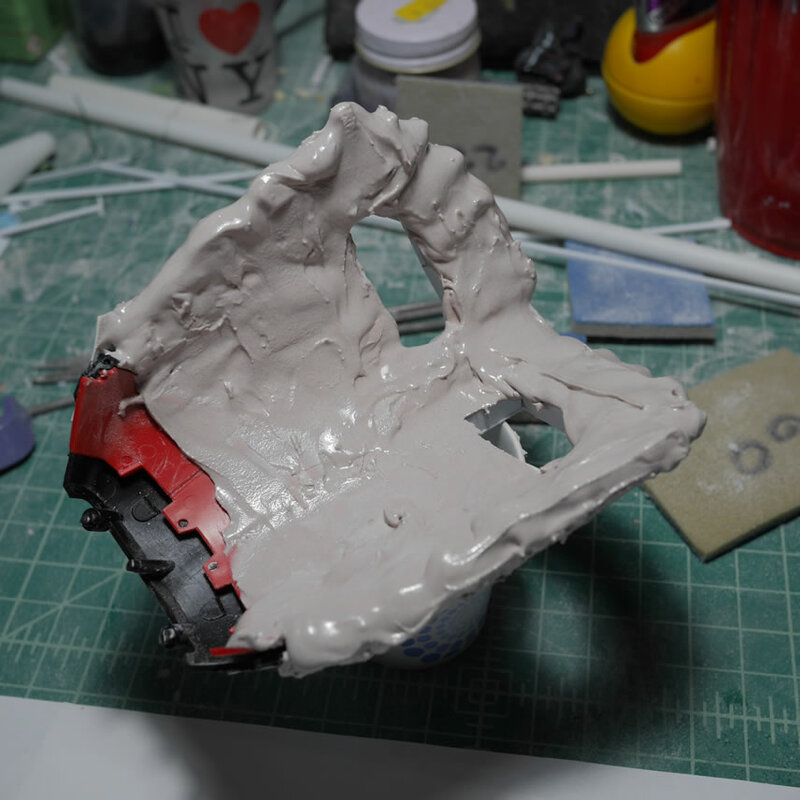 So in bending the part to uncurve it, the putty breaks and I have a area where I can add in some styrene rod as a structure to hold the part while I add more putty and basically adjust the shape of the rear skirt. While the above is curing, I get to work on the Dom’s rear belt piece. Reference pictures show that there is a cut in the part so after some measurements, some dymo tape is dropped and I go to work on removing the excess plastic. With most plastic removal processes, I drill out pilot holes and then cut the excess plastic and sand down the edges to get the finish I want. 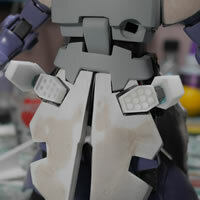 A quick test of the belt over the rear skirt piece. 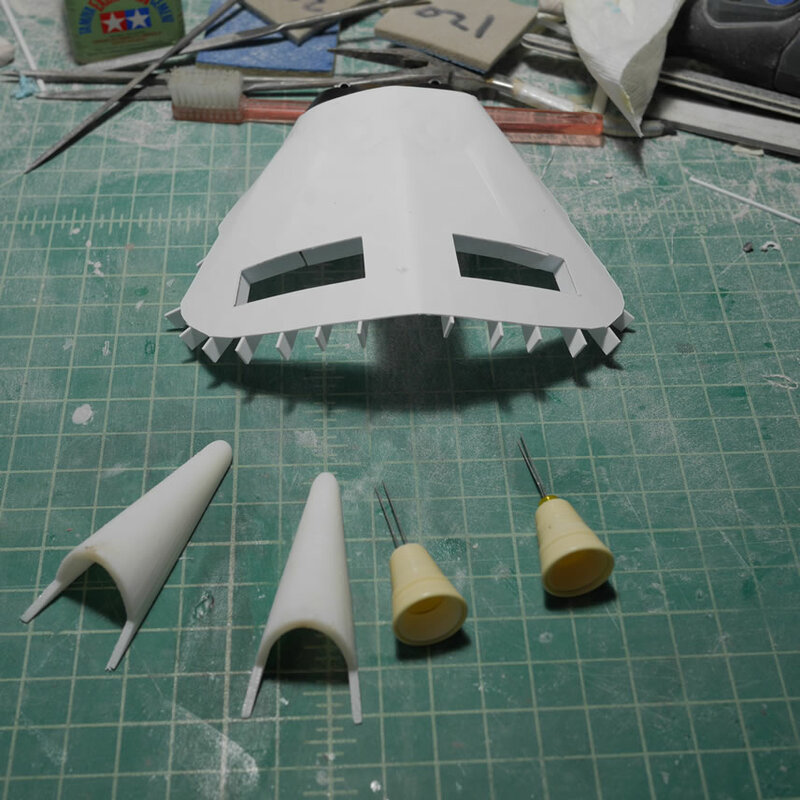 From the reference pictures, the cutout are where the tops of the thruster engine covers go, so that design makes sense. 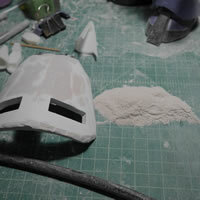 Sanding, sanding, and more sanding results in a pile of plastic dust. 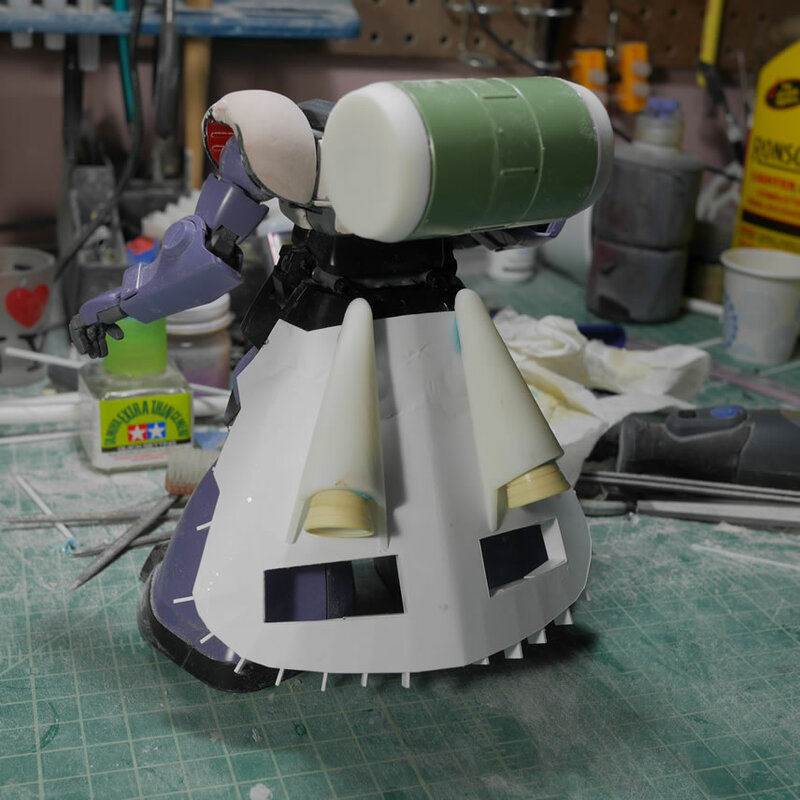 Returning to the front skirts, I go back to Blender and design the rocket pods that go into the front skirt pieces. 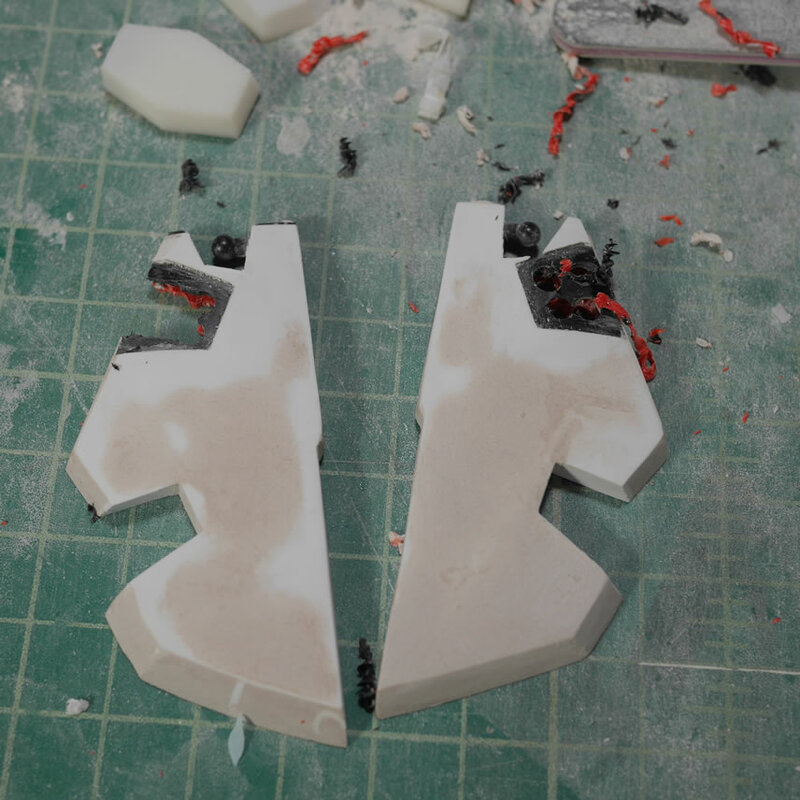 Since I’m going to try to have them openable, I designed the cap piece first, then from that cut it out and worked out the base piece. 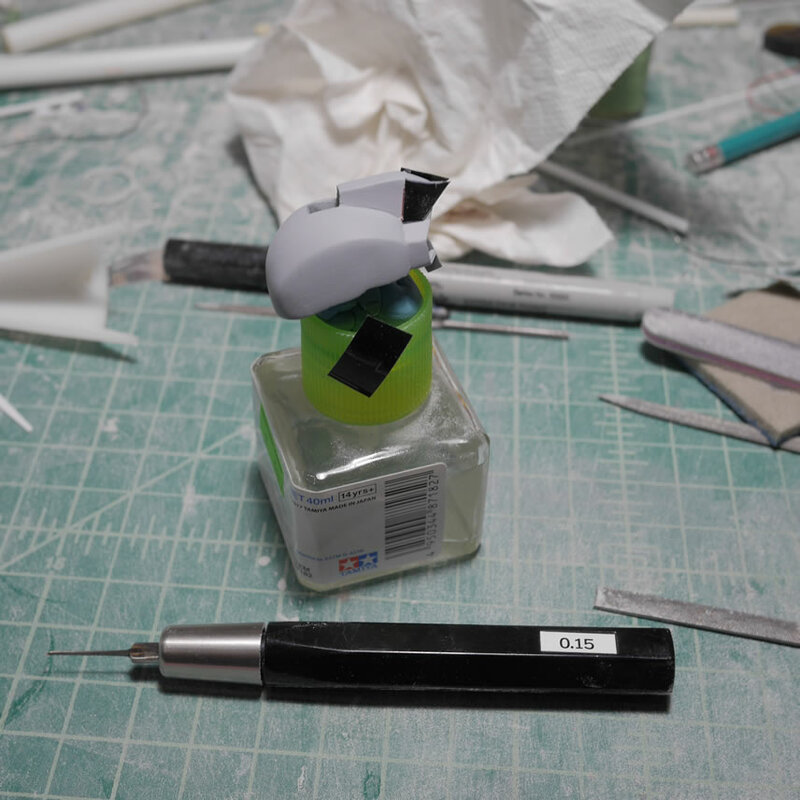 I also designed it with and without rockets. I figured I could make the missiles from styrene tubes and paint them separately. 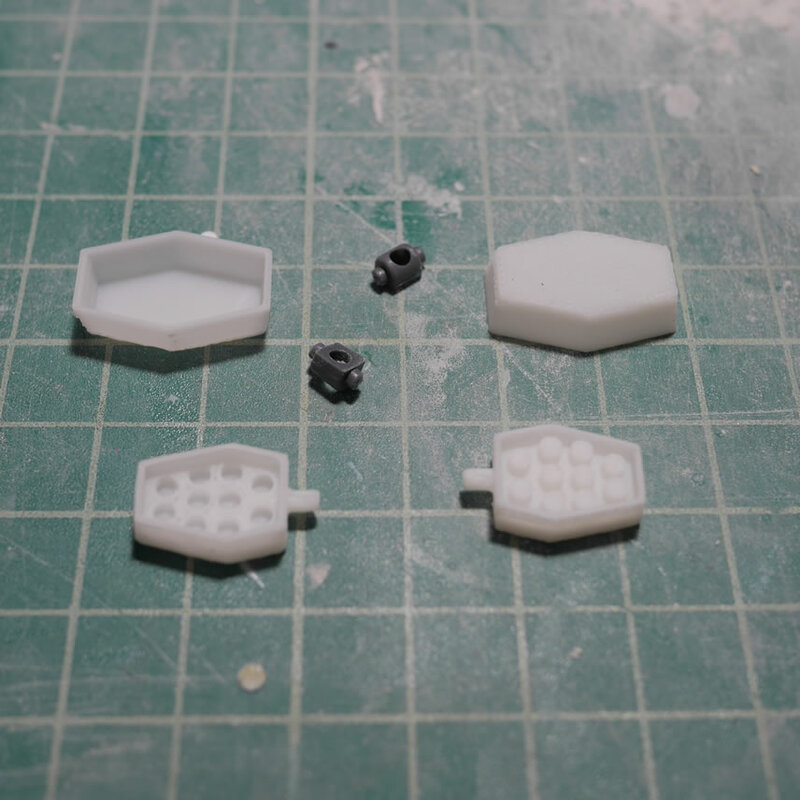 But I think the pod with rockets will probably be easier to work with since I don’t have to fill and sand as much for the pod without rockets. 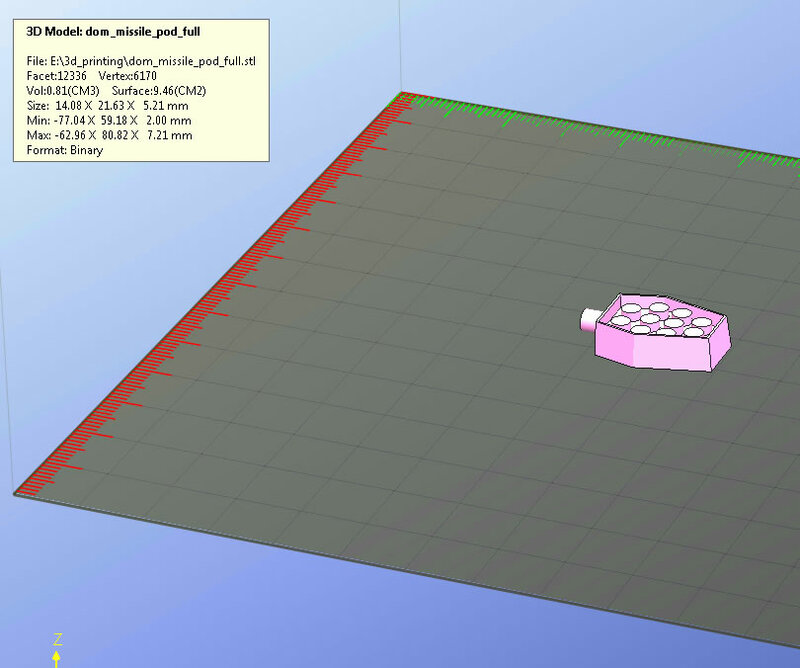 Below are the STL files for the rockets; clock on the images for the STL file download. 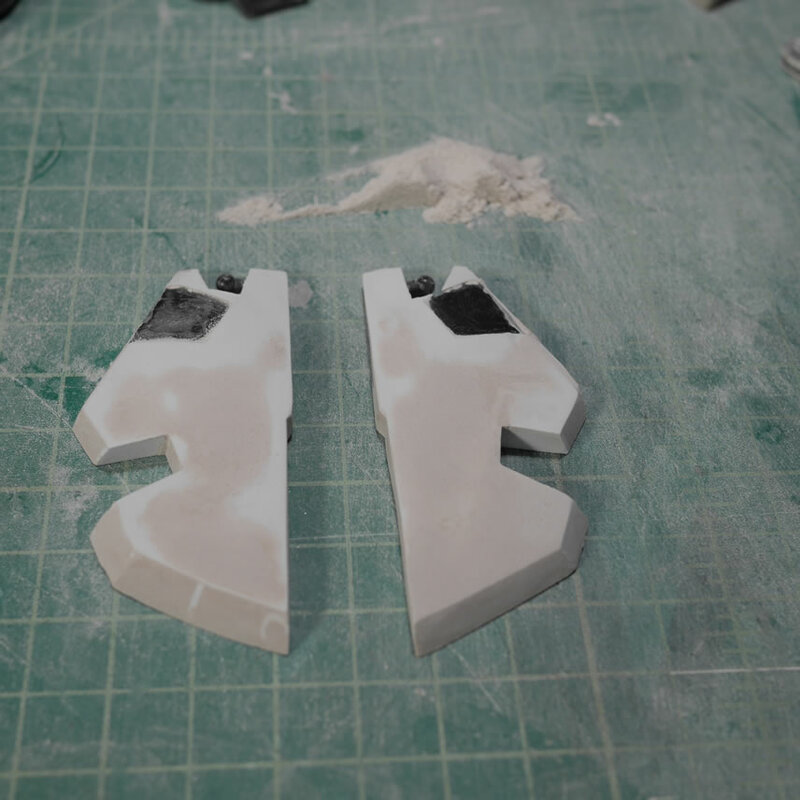 I used larger pictures so you can see the size reference I used when I scaled these prints out for the Dom. 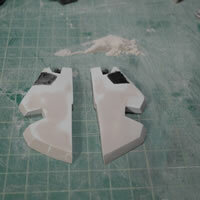 Here are what the pods look like just tacked onto the skirt. 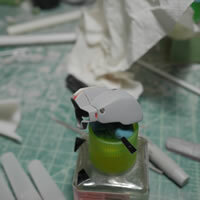 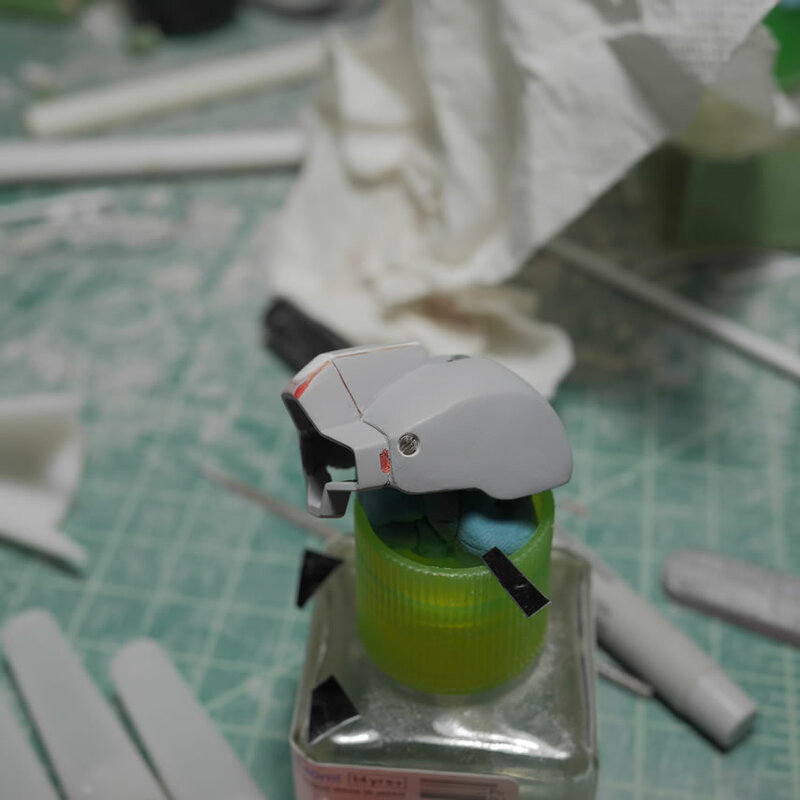 I used sticky tac to hold everything in place as well as display the pods opened and closed. 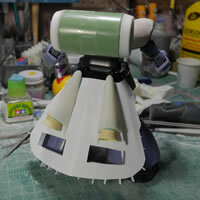 I will need to cut out the skirt pieces to fit the pods into place. 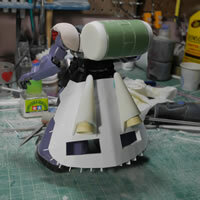 So that work on the front skirts started with drilling out pilot holes and then sanding. 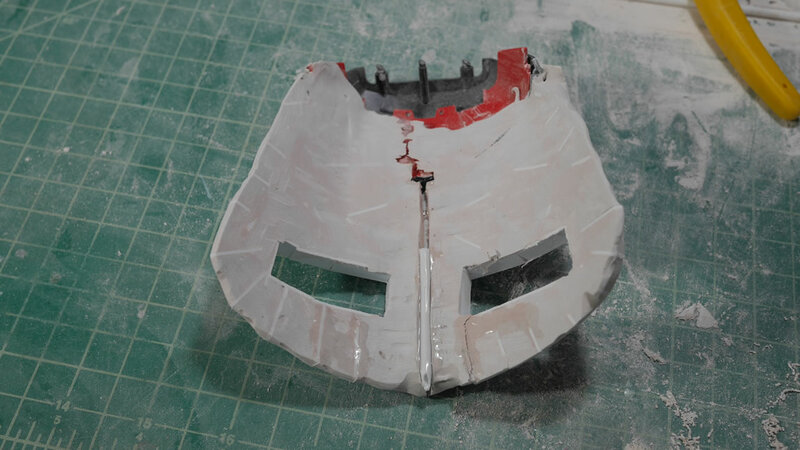 The upper edges of the skirt are very thin once this area is cut, so I reinforced this area with strips of styrene glued into the two halves of the Dom’s original front skirt parts. 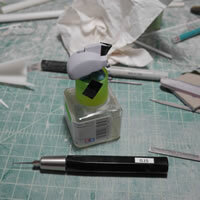 I also have a quick mockup with the lower small rocket pod. 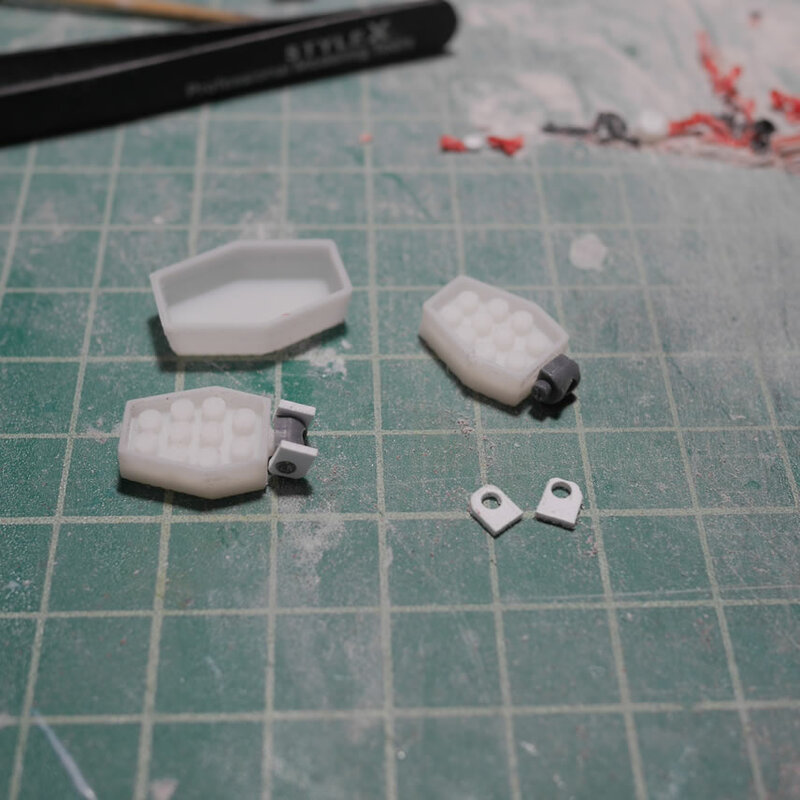 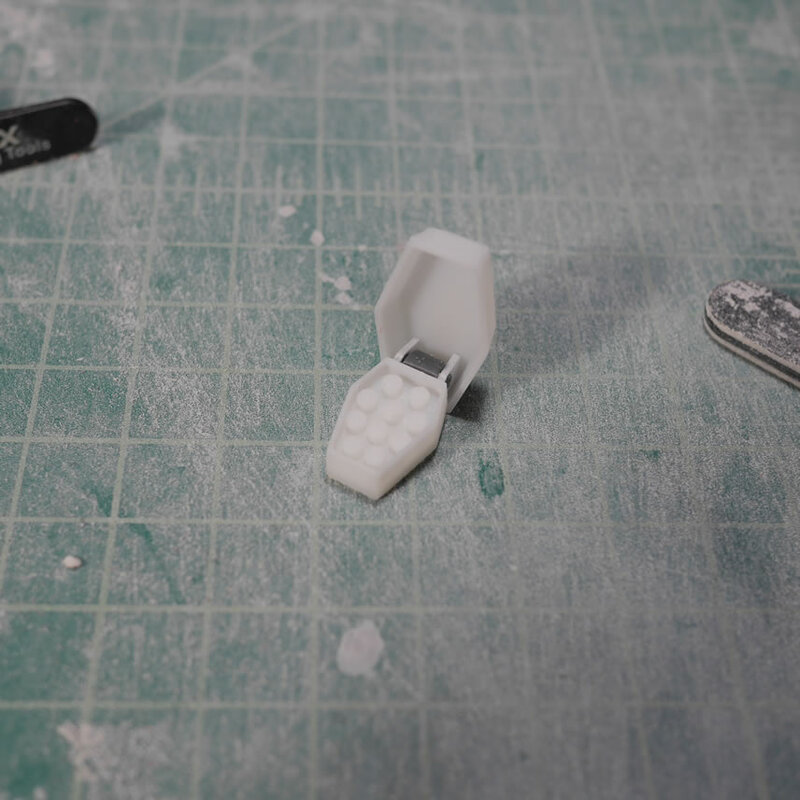 I designed the opper pods to be openable with a polycap, so a few stripes of styrene cut to size and a hole punched to fit the poly cap and I have a hinge piece. 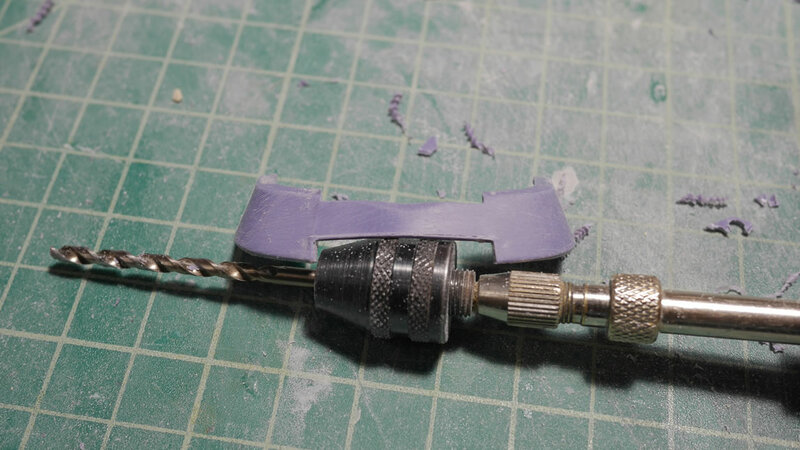 A fairly large hinge piece mind you. 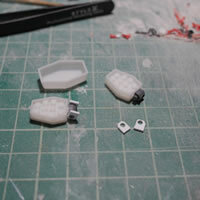 I will have to design something completely different for the lower skirt pods as they are much smaller than these pods. 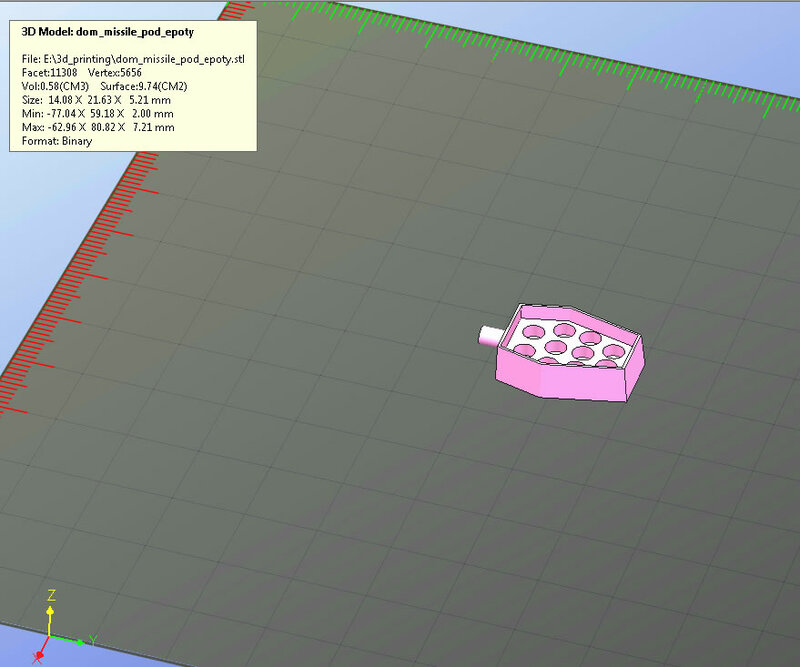 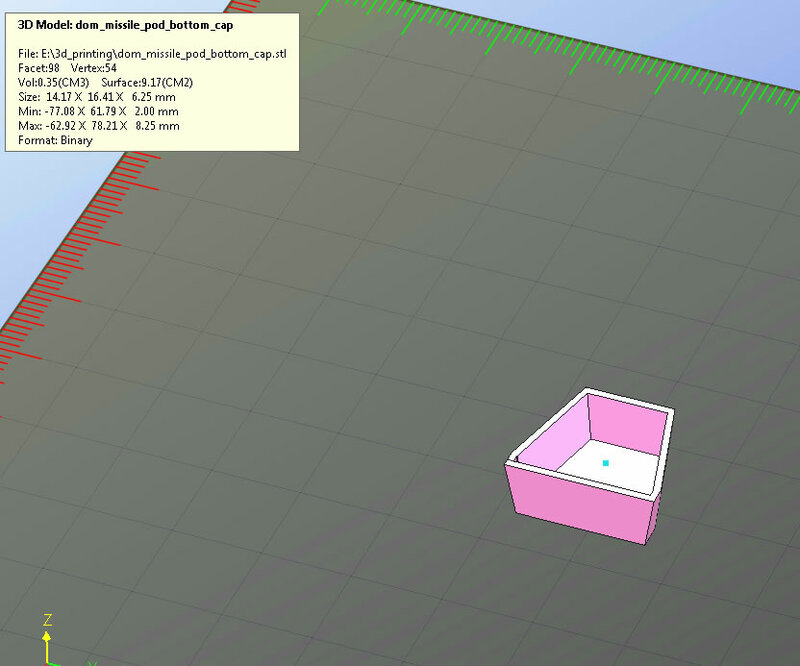 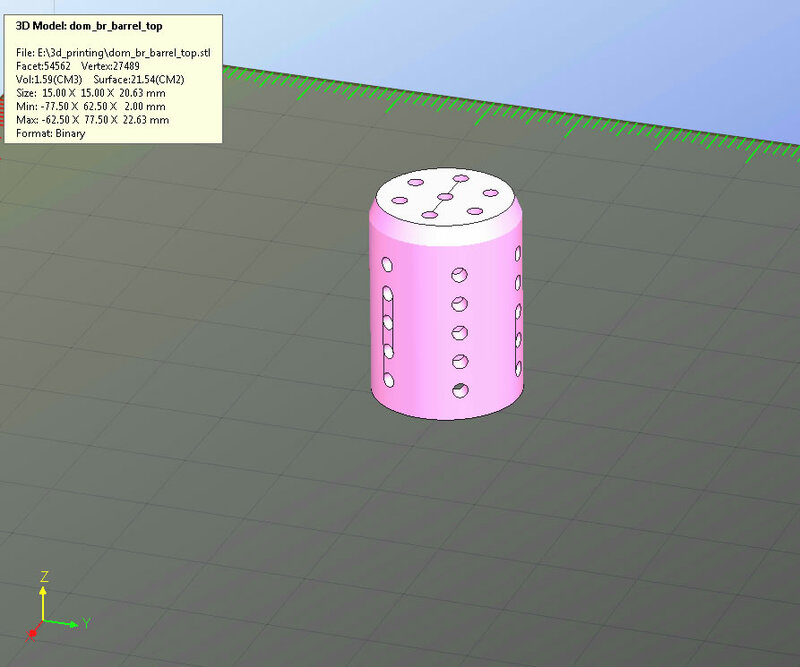 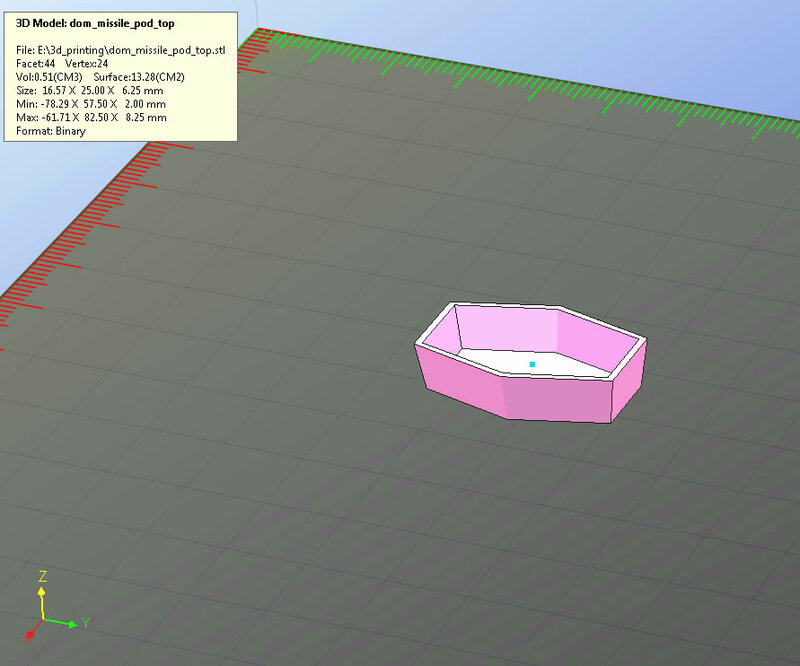 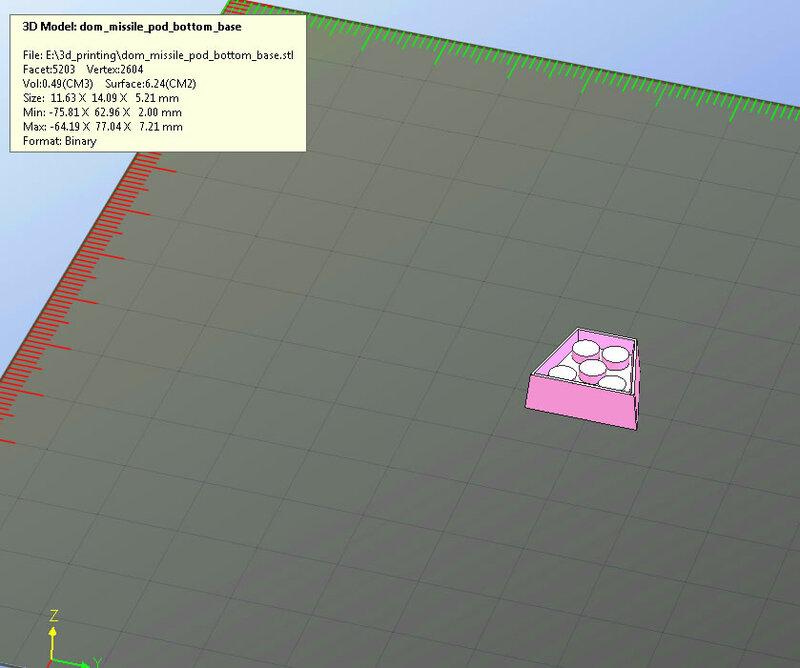 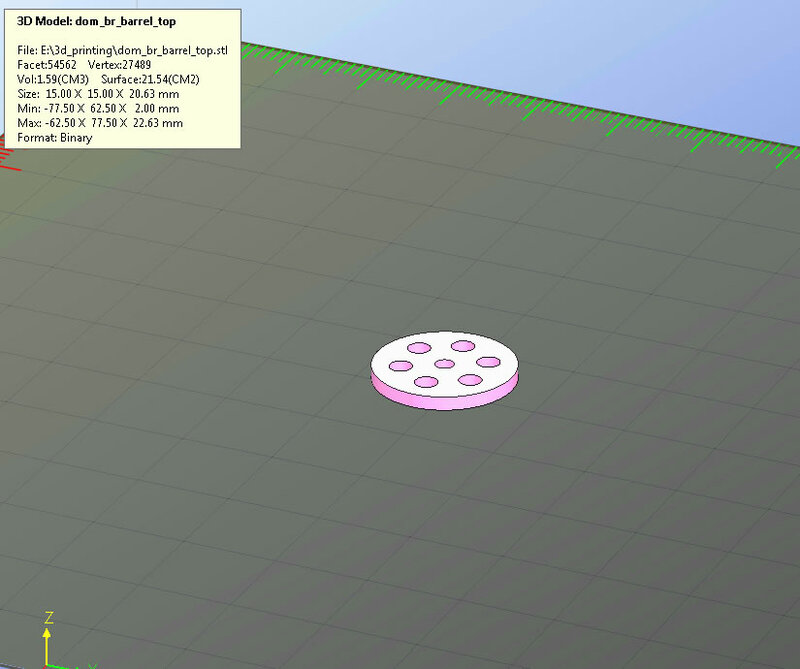 Since I’m posting up the STL files for this project, here are the files for the lower skirt pods. 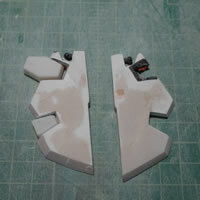 Here are the three pieces for the gatling gun front. 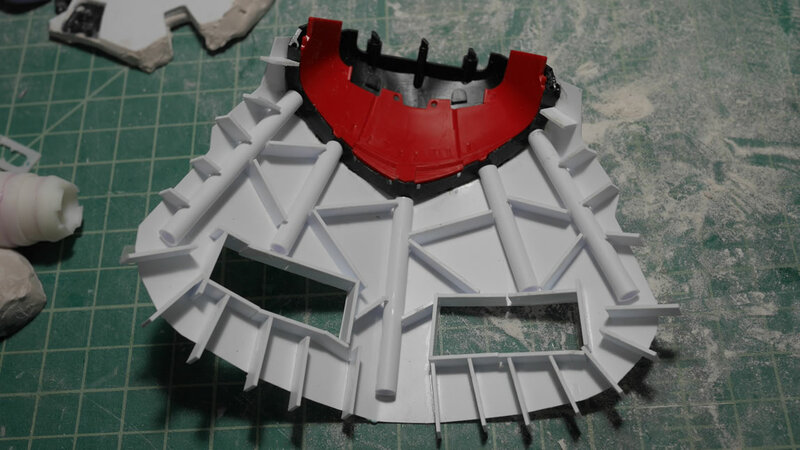 They include the barrel, the center support and the barrel base piece. 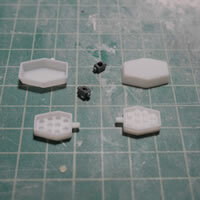 Styrene tubes thread through these to complete the front section of the gatling gun.